get me a soap manufacturer closer to home, please?! This bottle (pictured above) is related to one of my life-changing decisions this year. When I was buying it last year it seemed to make sense to me because: a) it was blue in colour b) it carried the words “For Men”. But even as I picked it off the shelf of City Joy supermarket in Mbuya, I was ruing the absence of a home-made brand that I could use, and felt bad that the Ushs6,000+ I was spending was mostly going to Turkey rather than to a soap manufacturer right here in Kampala, or perhaps in Hoima or Kotido, who might end up spending some of it to send SMS messages using SMS Media or something close to me. Which is why I am stepping back a little bit to assess more of what the marketing people have gotten us to do with our money, and find ways of changing that for our benefit. The only things about my bottle of soap, for instance, that claims to be “For Men” are: a) it is blue in colour b) it carries the words “For Men”. Reading the rest of the text on the back of the bottle and employing the venerable services of Google Search and its cousins Wikipedia et al gave me no indication whatsoever that it would be risky or unsuitable for women, girls or boys to use this product. “Xtraa Care Body Wash is a combination of effective active ingredients with extracts of Seaweed revives your skin as you shower. It helps to maintain and restore the skin’s natural moisture balance.” reads the top of the paper on the back. First of all, the damn product’s name is mis-spelt – which irritates me. Then, to my alarm, the grammar is suspect – like you find on those boxes of those shrill sounding toys made in the Far East and sold in supermarkets in Uganda. I haven’t tried bathing with Omo or Nomi or Jireh but I suspect that if I did they would leave me feeling clean and relaxed, as I have noticed over the last thirty-something years tends to happen after I bathe – even when I used to bathe using what we used to call ‘washing soap’. If the manufacturers of ‘Kisumuluzo’ soap (is it still there?) could write anywhere that it was “a gentle formula to leave you feeling clean and relaxed”, would that be untrue? “Sodium Laureth Sulfate” – according to Wikipedia, “an anionic detergent and surfactant found in many personal care products (soaps, shampoos, toothpaste etc.). SLES is an inexpensive and very effective foaming agent… (it is a) surfactant used in many cosmetic products for (its) cleansing and emulsifying properties. (It) behaves similarly to soap.” Basically, it makes the soap foam or bubble up when you mix it with water. “Cocamide DEA” – again, Wikipedia tells us, “It is a viscous liquid and is used as a foaming agent in bath products like shampoos and hand soaps…” It makes the soap foam up or create bubbles when mixed up with water. “Cocamidopropyl Betaine” – same as immediately above. Seriously, it is “used as a foam booster in shampoos” and “to a significant degree has replaced cocamide DEA”, Wikipedia says. There are thirteen (13) more ingredients and not enough time to google them all for the purpose that brought us here. There is also no indication of the amounts of each and the mixture made. But let’s note that one of them is “Parfum” which is simply “perfume”. I have even less time left now for this. Because of the quantities of all the ingredients involved, it is likely that the most expensive thing about this bottle of liquid soap is the combination of the bottle packaging, the label and the glue used to stick the labels on. If one of these people making soap in garages in Kampala could get their packaging right, they could make us spend Ushs6,000 on 500ml of soap that is “Active” and “For Men”. Or “For Women”. Or “For Children”. Or “For Married Couples”. Of course, the same company probably makes other soaps “For Women”, and enough varieties of those that it is not afraid of restricting this particular bottle to only “Men”. Technically speaking, they are not lying or misleading us when they label the bottle “For Men”, because they haven’t said it’s “Not For Women” or given us any caveats on other genders washing with this soap. A quick internet search of RAA Ltd. wasn’t very useful, as their Facebook Page is only a suggestion page (I think created automatically by Facebook using some web search method) with 9 Likes, and whereas the online Yellow Pages of Kenya lists them it isn’t very revealing. Does it contain a stamp from the Uganda National Bureau of Standards? No – even though we DO have a standards on toilet soap called “US EAS 186: 2011, Toilet soap – Specification“. So we don’t really know whether it is even genuine soap or not, or whether the mixture of the above chemicals (ingredients) is safe for our use or not? No – we don’t. 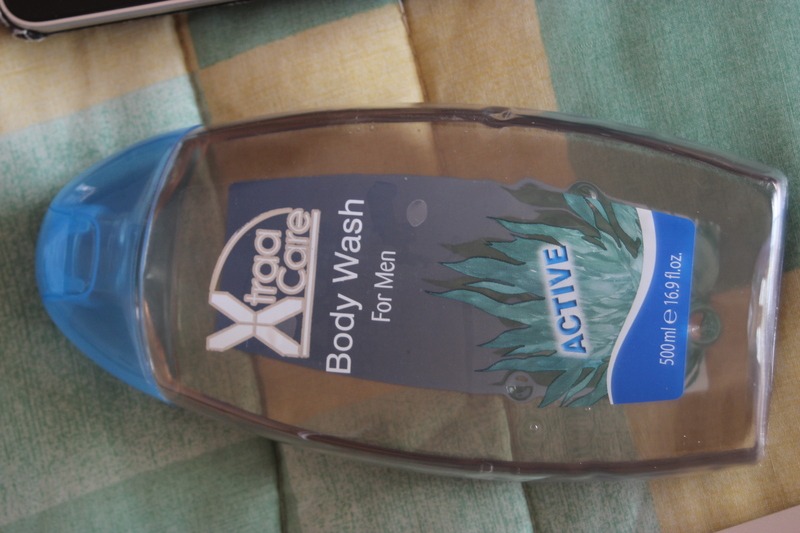 Again, therefore, if one of these people making soap in garages in Kampala could get their packaging right, they could make us spend Ushs6,000 on 500ml of soap that is “Active” and “For Men”. So, stressing my position now: I am looking for a Ugandan soap manufacturer. Any suggestions? Just get me one who has worked out packaging, a good brand name, and the right spellings and grammar on their labelling and marketing materials. In fact, I can help with the spellings and grammar, and may even overlook it more than I did this Turkish bottle. Mind you, I bathe A LOT and most of us need to bathe even more than we already do, so the opportunities available here are MASSIVE and we should be serious about this! I own a pair of lugabire (that’s the vernacular name for rubber-tyre sandals or flip-flops). Keep calm and read on, I am not here boasting about my wardrobe achievements, even though the lugabire are a neat pair. I actually have two pairs – the first being very contrived, with cloth bits and a touch of exotic fine art that elevates them too many levels above the ordinary lugabire that in my childhood I only ever saw beneath the feet of miserable men pushing wheelbarrows. 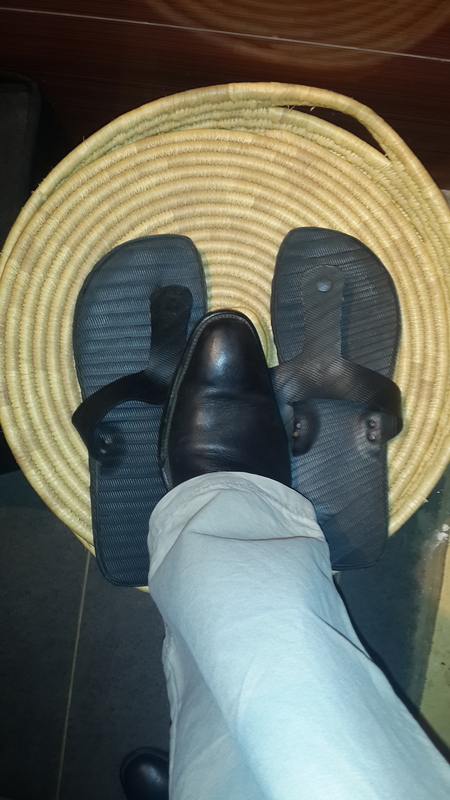 My authentic pair of lugabire is straightforward, humble, but so decent that I have found myself standing in them at people’s homes over weekends (on informal visits, of course, and strictly with the closest of relatives and friends). I don’t even notice until someone brings it up or I have to make a quick dash in the life-saving direction of a child attempting inadvertent suicide or to a BBQ table. The last time someone brought them up in conversation was at my brother’s house, and the person who raised the topic, one Bryo, is a long-time coxcomb fresh (excuse pun, since the vernacular-slang for coxcomb is “mafresho”) from his United States base via his expatriate home, so his view was of even more significance. “Yeah!” I replied, half-modest but a little proud that this Nike-, Adidas-, Reebok, Sean-Jean, Hublot-, Armani-and-so-on-and-so-forth wearing fellow had found reason to so clearly pay that lengthy, eloquent three-word phrase of respect for my lugabire. If you’ve ever seen my feet you will appreciate why I am not one of those must-wear-sandals-at-weekend people. Yet these lugabire bring this out in me because they are comfortable enough to wear and I know the fellows who made them. I don’t know them in the sense that I can recount their family trees going back any distance; in fact, I don’t even know their names or phone numbers right now. I just know that they are located in Nakawa, just above the place everyone calls “Em-TACK”, on the verandah of a red-brick-tile building with a distinct slant to its front wall up there, that you always see when driving from one traffic jam at the Nakawa-Lugogo lights to the jam at Spear Motors and Stretcher Road junction where the police play their torturous mind-games. There are about eight men sitting on that verandah up there turning tyres into neat sandals, and they have been doing so for years and years, they say. They were lucky that I was fighting with a mechanic ensconced in that neighbourhood and while retrieving a vehicle from him spent a couple of hours hanging about till they caught my attention. Within ten minutes, I had negotiated two pairs of lugabire out of them at Ushs8,000 each (my wife rarely wears hers but she “likes” them. Mbu. Anyway, I suspect they think they over-charged me – and I laugh at them (Mbasekeredde, as the late Samson Kisekka would say!) They refused to believe that people like Bryo spend more than US$50 on a pair of sandals. Still, I activated my lugezi-gezi and advised that they give their sandals a brand name, erect a signpost above their verandah so people could come deliberately to buy their lugabire, and then go down to Capital Shoppers, Game and Shoprite and try to sell them on the shelves there. Their problem, they said to me, was the supply of tyres. They sometimes have more tyres than they need but mostly they don’t have enough. Their strategy for acquiring these tyres is sitting and waiting for people to dump them there (remember, it’s near a set of jua kali garages). The conversation returned to me this Monday morning when I saw a photo in The New Vision of a policeman standing above a large heap of rubber tyres SETTING THEM ON FIRE!!! “These tyres were imported from Kampala. We received information that some opposition officials were planning a riot. We do not take risks; we had to take action.” reads a quote attributed to an unnamed source – and it was a good thing that the ‘source’ wasn’t named otherwise (s)he would be the subject of much well-deserved public ridicule. In the photograph of the Masaka Police boss overseeing the burning of the tyres, there are a couple of youths holding up lugabire, and the story tells of how the youth claimed they had asked the Mayor to grant them the spot for this very purpose. Would that the District Security Committee had gathered a quick team from the Private Sector Foundation and Enterprise Uganda to quickly mobilise the youth and turn these tyres into a pile of well-labelled lugabire for the likes of you, me or even Bryo to buy! The political tide in Masaka would have turned somewhat because the issue that ignites the youth to riot would have been sorted out. In fact, the solution would have put the police in the unique position of arresting any youth found NOT using these tyres to make lugabire and sell them for massive, life-changing profit. Unfortunately, everything political in Uganda today is tinged with “opposition” and “riots”; and those hopes of creating a new brand of footwear in Masaka and winning global awards for recycling in an environmental friendly manner while creating wealth and boosting local industry all went up in flames. 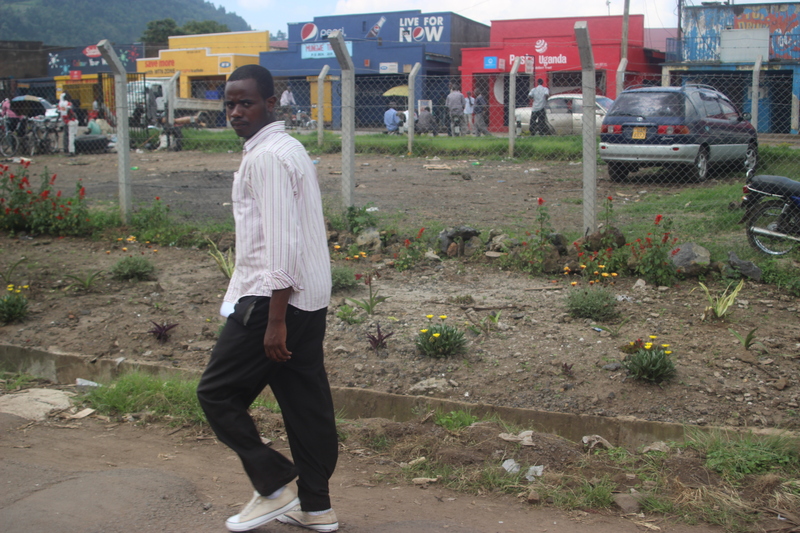 We were driving slowly through Kisoro town on Christmas Eve and I realised I was feeling even more chirpy than usual. Granted, Christmas evokes a nice, warm feeling in me regardless of where I am, provided I am with family, but there was an additional, brightly coloured array of feelings that made me think specifically of the district and municipal leadership. I don’t know them all personally, even though one of them is a relative of sorts, but I had an extra amount of cheer and goodwill towards the leaders of the district. Since this doesn’t normally apply to politicians in general, I turned my thoughts to working it out, and was at the Kisoro Natural Honey building when I put my finger on it – not on the building, on the reason for my convivial disposition towards these politicians. It had something to do with the flowers lining the side of the road. If you don’t know Kisoro, Google it; but briefly, it’s volcanic so the soils are black and grey, the side roads are rocky, and the rocks are jagged. All around it are volcanic hills commanded by the Muhavura Ranges covered in green and black like soldiers. Many of the homesteads are walled by short embankments made of the same grey or black jagged volcanic rocks. Set against each other, the dark metallic greys and lush greens are the vain wish of an interior decorator, and in more developed countries they charge you a lot of money to recreate the effect in sullen places. Which brings me back to the Kisoro District leaders; if they are not a team of decorators or landscape artists, then they have either employed the services of good ones or they were each raised by a good set of responsible, home-maker parents. The flowers that brightened up my mood and the roadside are uncomplicated clumps of yellows, pinks, blues, whites and purples, planted in deliberate, consistent lines in a dependable order. The sun reflects off them more pleasantly than it would bounce off a glassy marble-tiled skyscraper. Kisoro doesn’t have to say or paint those three little words for you to appreciate that Uganda is, indeed, ‘Gifted By Nature’. A couple of months before that, when the Kampala Mayorship scuffles were at their height, some people including a senior (age-wise) politician made commentary to the effect that the flowers planted around the city were not enough reason to applaud the city authorities. I think very different – whereas flowers or aesthetics are not the only deliverables I demand from the authorities, they are very welcome and sorely needed. Make any place look nice and you will attract people; plus, they will be in a good mood when they get there; and, most importantly, they will try to maintain or improve on the beauty, and thus they behave better. I recall vaguely a study in the United States that concluded that crime-ridden and poverty-struck areas changed for the better when cleaning and beautification programmes were introduced there. I believe that’s because of the nice feelings caused by the sight of flowers. It’s the same principle we follow during courtship, some of us. And at kwanjulas and weddings we decorate homes, venues, cars and even the bridal couples themselves with bouquets and floral arrangements that include a carnation on the lapel of the most square-faced groom. Being a lush, tropical country with the world’s best climate, it’s should be obvious that we’d choose flowers for everything of this nature. Businessman Kwame Ruyondo, a most amusing source of the most surprising conversations ever, once told me how a hapless fellow once stopped him in earnest to ask: “Naye compound z’abaggaga nga zimulisa obumuli amangu” (But why do well-to-do people’s compounds flower very quickly)? He didn’t have an answer, but asked the fellow whether he had planted flowers at his own place of abode. 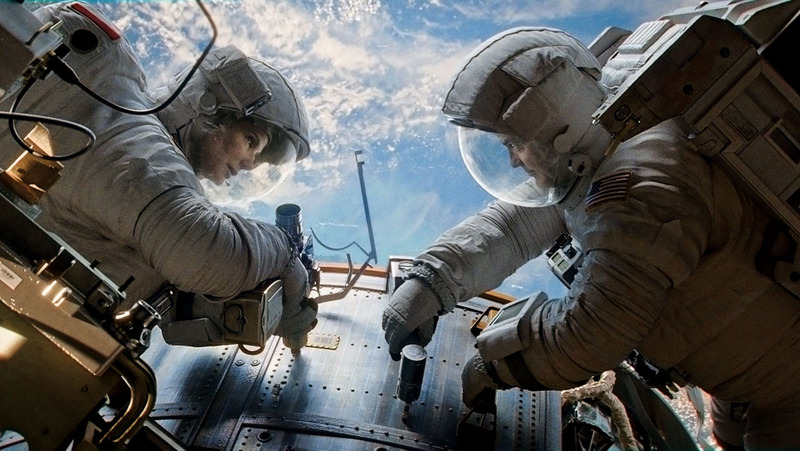 While watching Gravity one family movie night during the Christmas holiday I stopped half way and left the room for good. This was at the point where the female American space scientist was overcoming the umpteenth life-threatening challenge in outer space. Just to be clear: She (played by Sandra Bullock) was a scientist carrying out her first repair mission on a satellite in outer space. Floating around clad only in a space suit, an accident occurs that detaches her from the machines and she hurtles through nothingness. The only other living person nearby helps a little bit before another accident sends him deeper into space and his probable demise. The female scientist encounters mechanical tragedies, a fire inside a space shuttle after she had taken off her protective space suit, loss of consciousness, disorientation, and more – all while alone out in outer space. Yet, true to the usual American movie propaganda, she manages to keep locating buttons and switches to start machines up again, working out rapid solutions to sudden problems such as the fire outbreak, reciting morale-boosting sayings to herself…and by the time I walked out she was still alive. The entire entertainment industry is one big national morale-booster for Americans – that’s why in movies all globe-threatening tragedies go to the United States and the world is saved right there by Americans. Which is not bad, but I was irritated because I felt that continuing to watch such movies was wasting time – instead of going out to develop and begin embedding our own Ugandan propaganda. That’s why I walked out: The movie plot and its elements were too remotely set from my life; I deal mostly with people who are totally helpless when their cars break down just here on Kampala road; who can’t take jiggers out of their own feet; who can’t do weather forecasts to avoid getting wet or swept away by landslides. There is something probably in our educational systems that builds this self-doubt and lack of confidence and we need to weed it out in order to get to outer space, let alone imagine ways of dealing with problems when we get there. It might not be in schools alone – there may be uncles or aunts somewhere who go about building doubts in children; or friends who ridicule all attempts and ventures and collapse in howling laughter when one falls; or donors who bring help from above and build a reliance culture in us. We should find these stimuli and crush them like samosas. Because on the other side of the globe, Americans generally think they own the world simply because that’s what they have been told from time immemorial. It’s so ridiculous that they have taken three very short, very common, very widely used english words and basically copyrighted them. Everyone seems to believe that this phrase was created by Barack Obama and now represents an attitude that is “American”, yet surely even I, a Ugandan, can legitimately declare that “I Can!”. Well, this year I am not accepting negative stimuli from actors or influencers around me, and invite only positives so that we go about with the confidence of proper Ugandans. My workmates the same, and when I am tempted to raise doubts about their abilities they have full rights to push back and make me a morale-booster. No questioning from me about whether they can achieve their contracted tasks – rather, positive encouragement. Eventually, perhaps our leaders at various levels will devise some national morale-boosting practice like they do in church when the reverend asks us to shake hands and wish each other peace all round. We will move from “Tusaba gavumenti etuyambe” to “Yes, We Can!” and be heroes in our own movies.